The Tollcross Residence is an absolute must-see for the discerning Edinburgh traveller. Located just off Lothian Road and nestled at the edge of the historic Old Town, this beautifully presented 1 bedroom property is the perfect escape for your next Edinburgh adventure. This sleek and stylish modern property includes all the mod-cons you’d expect, and even includes the piece de resistance of city centre accommodation - free parking! Thoughtfully decorated throughout, the Tollcross Residence is a delight for the weary traveller. The lounge area features sumptuously soft sofas and a flat screen tv - perfect for a late night movie marathon! Just remember to bring the popcorn! The room is wonderfully light and airy, and is also home to a dining area with space for 4 famished guests. Why not sit and read the morning papers over a good hearty Scottish breakfast, or sip a warm cup of coffee as you plan your next discovery. Adjacent to the lounge area lies a gloriously bright kitchen, with enough space for even the most flamboyant of cooks to work some magic. Sleek laminate floors range throughout, and we guarantee that you’ll have no problem at all whipping up a gourmet masterpiece on the range-style cooker. When you’re tired out after a long day pounding the cobbled streets, make your way to the Tollcross Residence’s pastel-perfect bedroom. A fluffy, cosy double bed with luxury linens awaits you, and we hope you have nothing but sweet dreams. As the bedroom is located to the rear of the property, noise will be kept to a minimum, so you can snooze the night away and wake up refreshed and ready to enjoy all the city has to offer. Completing this gorgeous property is an amply sized bathroom. Modern and carefully decorated, the bathroom features a bath with shower over, so you can enjoy a late night soak or an early morning shower - the choice is up to you. As we’ve already mentioned, this property does come complete with one designated parking space - but we haven’t even mentioned the deck! A delightful outside area, perfect for enjoying a crisp glass of wine or some al fresco lunch, the deck can be accessed from the bedroom or living area. 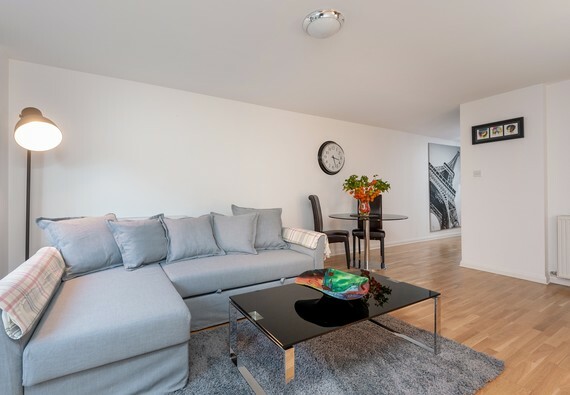 The Tollcross Residence is a rare find in the heart of Edinburgh, close to shops, public transport and a wide selection of cafes, bars and restaurants. The Bruntsfield area is one of the most affluent in Edinburgh, featuring a grand array of things to see and do. Why not take a stroll nearby and pick up some juicy steaks at the local butcher, or some cheese at the local French delicatessen? If that doesn’t tickle your fancy, why not pop out for a picnic in the Meadows, a popular park in the heart of Edinburgh. We can't guarantee the shy Scottish sun will make an entrance, so if it's looking a bit dreich, then we would suggest curling up in a lovely warm Scottish pub. There are a remarkable amount of homely, welcoming pubs near this property, including the Blackbird bar and restaurant, Montpelliers and The Apartment restaurant, to name but a few! If you'd like to venture further afield, then the area is well serviced by the efficient Lothian bus company, and Princes Street and the Old Town are a short walk away. Sleeping arrangements One double bedroom and one double sofa bed. Exterior This property forms part of a modern development, tucked away from the main road. An excellent, comfortable and spacious flat with every convenience. There was enough linen for our week's stay and the cooker and dishwasher were easy to use and both a good size, unusual for a rental flat. our host, Karen was charming and helpful, meeting us on arrival and explaining the area as well as the flat. We will try to stay here again next time we're in Edinburgh and will recommend it to friends. Many thanks for this brilliant review! I am delighted to read that you had a wonderful experience with us and we look forward to welcoming you back again.